Written by Mark Forrester on October 7, 2015 Blog, Woo news. Our primary focus these last three months has been the integration of our team with Automattic’s. Two distributed teams coming together, already sharing an unequivocal passion for WordPress? Sounds like a relatively straightforward merger. But even with our strong cultural fit and similar workflows, there were still nuances and differences that needed blending to create an optimal working environment for all. We’re all aboard for Automattic to be the best and most inclusive workplace the internet has to offer. People wax lyrical about the benefits and freedoms of remote working, but one of the many times it can be challenging is during immense change, when everything can feel a bit foreign. For those of you sitting next door to your colleagues — relish it! Making the transition has been fun and a privilege. We’re looking forward to face-time at the Automattic Grand Meetup next week, and meeting all the Gravatars we’ve been pinging on Slack. Adding some incredible Automattic developer talent to WooCommerce core to bolster security, scalability and extendability, plus more Happiness Engineers to support our customers. And we’re hiring. Forming better partnerships with payment providers and hosting providers (look out for promotions soon). Updating VaultPress to include WooCommerce tables as part of its backup offering. This should provide peace of mind that your site is even more safe. Most Ninjas have now completed their three-week support rotation with Automattic, learning more about our new customers and the wonderful systems and resources required to support them. It has been a truly valuable experience and has improved team integration even more. This post won’t provide you with a comprehensive product roadmap, but we’re happy to share some details on the discussions being prioritized as we move forward with Automattic. Being a smart bunch, many of you have picked up that we’ve stepped up our focus on WooCommerce in the past three months. Some of the fruit so far includes redesigned WooCommerce pages, new educational videos and partners, a dedicated @WooCommerce Twitter handle, and the WooCommerce Showcase. This is just the beginning. 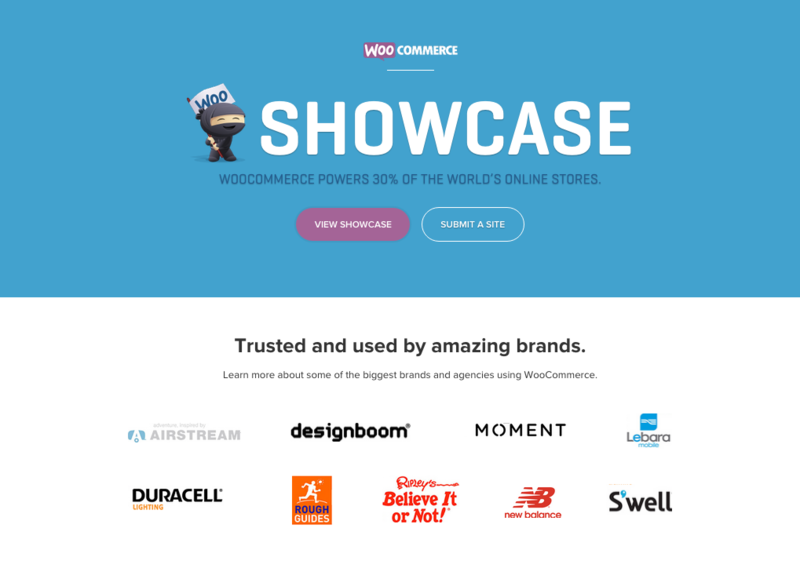 The WooCommerce Showcase, just one of our many recent projects. While that is an accurate description, it’s a mouthful. We’re currently fine-tuning the WooCommerce brand and messaging, making better use of WooCommerce.com as the home for our platform. Watch that space. Our partners remain hugely important. Being part of a bigger team enables us to do more in house, but we are reviewing applications and third-party extensions daily. With further improvements to the API endpoints in WooCommerce 2.4, and large extensions like that of Memberships and Subscriptions being developed outside of Automattic, our ecosystem remains a hotbed for opportunity. There are no immediate plans here. This is something we know folks are wondering about, and we will communicate should anything change. As for our themes and other plugins, to the extent that they complement our platform and we can confidently say they represent the best we can offer (i.e. code we’re proud of), they’ll remain actively developed. WooThemes.com has huge value and history, and we plan to continue to innovate in the theming space. It’s the perfect playground for Automattic theming adventures. Canvas retains a huge market share and neither it nor its development team are going anywhere. The lion’s share of our theming efforts will be spent between Canvas and Storefront, our eCommerce theme. With exciting new Storefront extensions and child themes, we hope to prove our experience and expertise in the arena we grew up and thrived in. We’ll continue to produce Storefront child themes, like the newly released ToyShop and Outlet, moving forward. Woo is a constant work in progress, with the potential to make a lasting mark in the world of eCommerce. Supporting our customers’ desires with opportunities and the innovation we’re capable of as Automattic is truly a balancing act, and will take time and thought. We’re excited for the ride ahead, and we look forward to sharing more detail with you as time marches on. As always, thank you for your support us as we learn and grow. Please add functionality for full width sections. Would love to see that hit Canvas. Hi, could you share any plans regarding Canvas 6? What are your plans regarding Sensei? While I am excited to see where you guys go, I’m really, really disappointed to see all of the themes you have discontinued. As a longtime Woo customer, I have clients from many years back who are still using original Woo themes. Now I cannot guarantee that their sites will be up-to-date and secure. With the October 2015 retirements, I think I will be webmaster for sites with more retired Woo themes than current Woo themes. That lack of long-term support is making me reconsider my “all themes package” — which I have had for many years. I understand that you are chasing after the thing that makes you the most money right now, but please understand that longtime customers are essential. Brand new “get rich quick” options won’t last, and if you alienate those of us who have gotten you to this point, your business model will fail. If there’s anything we can do to regain your confidence, we are listening and would welcome your feedback at any time. To suddenly stop updating Themes really puts those of us that create websites for clients in a really bad position. For example I’m in the process of creating two websites for clients using the Fashionable child-theme; I like to offer long-term good quality websites but now I can’t do that if I can’t be sure that the Fashionable theme will remain up to date by the theme Developer. I understand that WooThemes needs to retire Themes occasionally but perhaps instead of retiring with no notice you could give say, a years notice of retirement (so website designers and developers have time to prepare). With regards to retirements, we find them difficult, but they are necessary to help us improve our focus and deliver what is needed for success — critical bugfixes, stronger products, etc. I was very upset to see the list of theme retirements because it included a Canvas child theme that was just over a year old and which we just adopted *specifically* because we had seen your shift from other theme groups to focus on Canvas development! I’m also somewhat nervous to see no mention of what’s going to happen with Sensei here. Is that going to be retired now too?? Sensei is not going anywhere. We are hard at work on the next update, and development will continue as normal after that. Yeah bummer to see so many recent themes retired. Doesn’t inspire confidence. Nor does the fact that we still have no essentially nothing about what canvas 6 will be, and the fact that customizing Child themes is a MAJOR pain even with the plugin y’all built.